Despite US Support for “Official” Gov of Libya, Competing Gov Led by CIA Asset Benefits from Chaos in Tripoli 5 out of 5 based on 2 ratings. 2 user reviews. 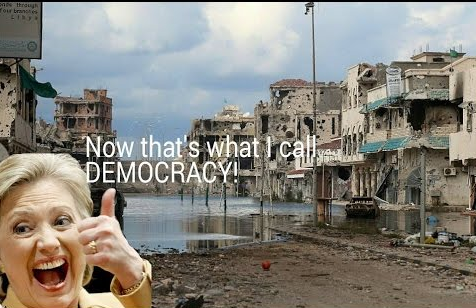 U.S. allies the United Arab Emirates, Egypt and Israel have been backing the “rogue” government of CIA-asset Khalifa Haftar, which controls Libya’s east as well as many of the country’s most important and lucrative oil fields and ports. The UN-recognized government of Libya — officially known as the Government of National Accord (GNA) — could be in its final days, as recent in-fighting within the GNA has dramatically escalated since it began last week, plunging the country’s capital into chaos. Since last week, the fighting in Tripoli has expanded and intensified — killing at least 40, including an estimated 20 civilians. Local authorities have reported that over 100 have been wounded. The fightingprompted the President’s Council of the GNA to declare a state of emergency last Monday, which still remains in effect. Indeed, U.S. allies in the region — such as the United Arab Emirates, Egypt and Israel — have been backingthe “rogue” government of Khalifa Haftar, which controls Libya’s east as well as many of the country’s most important and lucrative oil fields and ports. Haftar has long sought to depose the GNA and cement his control over the country, and increased in-fighting in GNA-controlled territory clearly poses an opportunity to Haftar’s government, which recently consolidated control over the entire eastern portion of Libya. Though it nominally backs the GNA, the U.S. has ties to Haftar, who has been an asset of the CIA for decadesand was even paid and armed by the CIA to lead a failed coup against Gaddafi in the late 1980s. Furthermore, an increase in Haftar’s control would help serve the Trump administration’s ambition to establish a “permanent military presence” in Libya. Last year, the Trump administration’s plans to establish a more permanent presence in the country notably called for “closer cooperation and intelligence sharing with Haftar,” even though his government is not recognized internationally. Wait… we’re backing the Libyan rebel forces who are trying to take control of their country back from the internationally recognized fake government in Tripoli? That’s what the f’king HOUTHIS are trying to do – shouldn’t we be supporting them? And why is anyone in Libya still fighting? Libyans are FREE today – the butcher Gaddafi was executed. FUKUS said this would fix everything for the Libyans. Remember, it was a humanitarian intervention by NATO. Gaddafi was going to attack al Qaeda ‘citizens’ in Benghazi – NATO had to stop the slaughter. There about 4 sides that matter in this war in Libya now. And 3 of them are either current or former NATO/Israeli assets (fake government in Tripoli, fake government in Genghazi, AQ+ISIS jihadists) and some smaller random disorganized gangs of mercenaries or tribes. BUT the 4th faction are the Green Rebels, the former loyalists of Muamar al Gaddafi, soldiers of the new Jamahiriyah who are slowly getting stronger and will have to take their country back from the imperialist’s minions! So , had read that Russia supported Haftar as well ? Anyone have that info. Who does Gaddafi’s son support ? He would seem to be the one able to reunite Libya.